Revoke all prior wills. The “revoke all prior wills” language is perfect for most folks, but it is possible to have more than one will. So be careful not to “revoke all prior wills” if there is a will you want to keep in effect. Establish residency. The will needs to be probated in the county/parish where your residence is. Yes, your will has to be probated (no matter what anyone says). If you are passing property through the will that needs your signature in order to transfer the property, there will be a probate. This section in the will template identifies your family or “heirs.” You need to specifically name your spouse and children. If you don’t have a spouse and children, than state that. One of the important lessons in the how to write a will scenario is to be specific. Some will forms will have you put the birthdate of each child. You are simply being specific, so there is no question who you are talking about. Because the will could possibly become a public document, as an identity theft precaution, I usually counsel against putting all of the birthdates in the will. In the new world of political correctness, the person who does the legwork to probate your will is called a personal representative. In the older will forms, this person was known as the “executor” (male) or “executrix” (female). The old will forms also often called for a bank to be the executor. Lawyers also like to put themselves as the executor. I consider it to be malpractice for a lawyer to do that, but I see it done all the time. A will template today should direct you to choose a family member as the personal representative. Most instructions associated with will forms will tell you to choose a series of possible personal representatives. The audio instructions with my Will Template will give you lots of “considerations” that need to be taken into account when you are considering who you will name as your personal representative(s). One issue many forms overlook is the need to appoint the personal representative in more than one jurisdiction. The primary probate will be in the county where you are a resident. Usually, if you request the appointment of specific person to be the personal representative in ancillary states, the other state’s courts will honor your request. The “other” probates are called “ancillary probates.” Multiple probates are a necessary but real mess if: 1) you have property in multiple states, and 2) the property is moving to your heirs as a result of your will. Any will template should direct the personal representative to pay the debts and taxes associated with the estate. The probate proceeding is designed to make sure all of the debts and taxes are paid before any of the heirs get anything. If you have more than one will or a will substitute of some sort, this provision of the will needs to be carefully coordinated with any other documents. Since the new estate tax laws went into effect in January 2013, the federal estate taxes are not an issue for most folks. However, there are about half the states that have estate taxes that can be a real bite. If you do have a taxable estate, avoiding the estate tax is a big deal. It’s worth every dime you pay to cut the estate taxes. Learning how to write a will or living trust that helps avoid estate taxes could mean hundreds of thousands or even millions of extra dollars for your family. It’s well worth any effort you make. 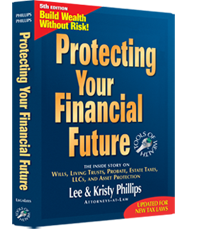 You can use my book, Protecting Your Financial Future, to educate yourself. If you don’t have minor children, skip this part. HOWEVER, if you have minor children, this is absolutely CRITICAL. Some of the saddest stories in my legal carrier are associated with folks who got the guardianship provision in their will screwed up, or they didn’t have a will. Even when the attorneys are showing you how to write a will, most of them don’t get this provision right. Don’t just name John and Mary as guardians. Educate the judge, who will be making the decision as to who raises your children. One common question is, “Can I prevent the ex-spouse from getting the kids?” The answer is technically no, but if you word the guardian provision correctly and educate the judge, you stand a chance of preventing an ex from getting the kids. Often a deadbeat ex doesn’t want the kids; they want the money. Using a trust can make sure your money goes to the children exclusively. If you have grandchildren, make sure their parents have wills and name guardians. How you dispose of your estate is up to you. It is hard to use a will template to get it right. Most of the will forms give you one scenario, i.e., equally to the kids. If you need something more than that, you’ll have to create your own clause. One issue that is important is disinheriting someone. This is where the estate gets sued. If you cut out son Joey, he will sue, so you had better be specific. Another issue is being too specific on the “property” to be divided up. Folks use the will forms and specifically give away each bank account, piece of property, stock, etc. The problem is by the time they die none of those specific assets exist. Distributing an estate is a fine balance between being specific and being general. Make sure you specifically dispose of the “dollies and doilies”–those items with little monetary but large sentimental value. Meaningful personal things are where the family fights occur. Many states allow you to write a “personal letter” that disposes of the dollies and doilies to specific individuals. The will has to reference such a letter. Most will forms will show you how to incorporate a document in existence at the time the will is written, but the personal letter is a document that you create after your will is written. If your state doesn’t specifically allow for a personal letter to be written, you can actually create a second will and get rid of the dollies and doilies, or use a living revocable trust. The “contest” provision basically says that if anyone contests the will they will be cut out as an heir. The provisions work, but they don’t work. They technically don’t work if there is a legitimate problem, but the provision gives the judge something to “hang his hat on” if there is a frivolous lawsuit. Most states allow you to have a “self-proving provision.” Even if your state doesn’t have laws specifically addressing the issue, it won’t hurt to have it put into your will. We recommend including it. Basically, what it does is make it so that the judge doesn’t have to call the witnesses in to verify that they saw you execute your will. The witnesses’ signatures are notarized, so the notary is acting as the judges “eyes” to verify that the witnesses were there and signed their names. It could prevent some problems if there was ever a question as to whether or not the will was properly executed; you were competent when you signed the will, etc. Your will should be written so that you make certain representations in front of the witnesses (all states require two witnesses). The self-proving will forms will have a statement just above your signature. You should basically read the statement to the witnesses. You will state that you are over 18, acting of your own free will, etc., etc. It’s an important part of your will template and the “formalities” that should be covered when you learn how to write a will. A notary is not a required part of the will. It is part of the self-proving provision. Technically, the notary is notarizing the witnesses’ signatures in order to make the will a “self-proving” will template, but there isn’t any harm in having the notary notarize your signature also. It is the witnesses that “validate” the will, not the notary. No matter how you write a will, there is no way to avoid probate if the will is actually used to transfer property. A will has to be probated if it is going to be used to pass property. There isn’t any way around that fact. Probate is the legal process that gives the will validity. No language in a will template or any of the will forms will ever prevent probate – if the will is used to pass property. Most people should avoid probate. It is expensive, time consuming, and just plain frustrating for the family. There are horror stories galore about probate. In theory, many states have adopted streamlined probate laws. The fact remains that it is a vulnerable time in a family’s life. Unfortunately, there are a certain percentage of lawyers that will take advantage of a family during the probate process. It is unfortunate that 95% of the lawyers give the other 5% a bad name. (Ok, that’s a joke.) But there are a lot of families who are taken advantage of. I have a friend who is actually an immigration attorney, and he did a probate for a close friend. I coached him through the process. Whoever wrote the will had no clue how to write a will, but that’s what he was stuck with. I remember him saying to me that he was trying to get it done as soon and as well as possible, but he was in it about $40,000 in billable time, and it was only an estate of a few million dollars. The point is – avoid probate whenever possible. There are times when probate can be used to great advantage, and you want to probate the estate. I talk about that a lot in Protecting Your Financial Future, and go into detail about probate avoidance techniques. This book shows you step by step everything you need to know to protect your family estate and accumulated riches. 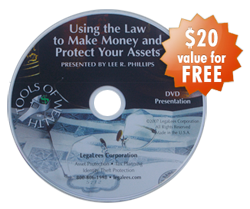 This DVD Presentation will give you proven strategies showing you how to make more money by keeping the money you make.